Information and Communications Technology Equations Redefined | Business Article | MBA Skool-Study.Learn.Share. An IT company based in Bangalore, ThoughtWorks gave away 1000$ to their employees to buy smartphones for themselves. Another Bangalore based started a new and quickly catching up concept in the world of IT called as BYOD (Bring Your Own Device). The concept encourages the employees to get their personal tablets/smartphones to work and use them to participate in conferences, attend meetings etc. 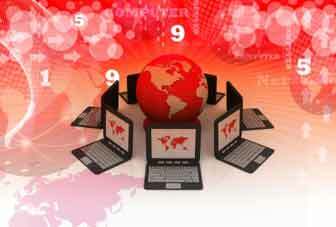 India is witnessing an IT revolution and is changing rapidly with the technological changes happening around the world. Information Technology and Communications has brought about a new avenue in the Indian economy to which Indian firms are adapting to gain a competitive edge over their competitors. Let’s ponder over a few more points to understand the relevance of IT today. What do you think is common between TS Vijayan, the head of LIC and Ashok Sinha, the MD of BPCL? These eminent personalities became the heads of their respective companies from the position of a CIO (Chief Information Officer). These events indicate the changing and growing trend in India, where the IT heads of companies are becoming highly critical for organizational growth of the companies. ICT has now become an indicator like other economic indicators to measure how much the country has embraced technology.This article will give you a brief about how IT and communications has evolved and has become the differentiating factor between companies. IT has played a major role to act as an inclusive force that covers all sectors under its influence. Hence we have the buzz word of “financial inclusion” which enables all corners of the country to be accessed via IT. Indian government has already taken the first step, by initiating the UIDAI Aadhaar programme under which every citizen will be enrolled based on their hand prints and biometric eye print. This will involve huge IT infrastructure to support profiling and maintaining databases for the entire country. Likewise if one takes the case of IT companies, most of them today are transforming themselves to take on higher challenges to deliver more value by leveraging technology. Companies like TCS, Infosys, and Wipro are trying to move up the value chain in offering their services. What this effectively means is that IT companies today are on their way to provide consulting services as well as ensure the delivery of end to end solutions for their clients. The business models of all these companies have undergone a huge transformation with time. Banks have also embraced IT and have enabled e-banking and mobile banking at a huge scale to be competitive. A report by Springboard research says that India’s enterprise mobile workforce is expected to grow from 134 million in 2011 to 205 million in 2015. Nearly two-thirds of the Indian mobile work force is likely to own a smart mobile device by 2015. The use of IT has greatly revolutionized banking in their quest to understand their customers. 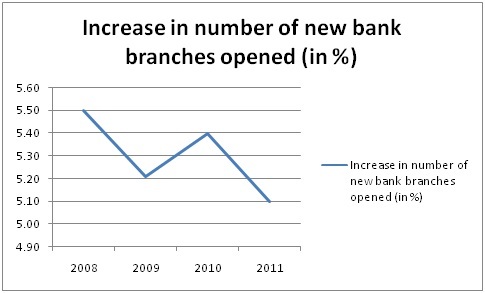 The branch density of banks has come down drastically (See Exhibit). The emergence of net banking, mobile wallet and use of NFC for e-money has taken transaction and payment systems to a different level.There are actually a few banks that charge the customers for visiting their branch for a service that could have been done online.The banks that manage and understand the information of their customers with the help of IT are the banks that will move ahead in competition. Take for example IBM. IBM has a new hire – Watson which is an IBM computer. IBM hopes that in some time Watson may do the same work that analyst’s do now i.e. looking at thousands of company forecasts and help their decision support systems. Likewise Paypal has also come up with Igor, a computer system that looks for patterns and compares the payments for any fraud or money laundering. The emergence of ERP’s and CBS systems has revolutionized the traditional banking and has helped banks to be inclusive at a massive scale. BI (Business Intelligence) tools sitting on top of these ERP systems help banks in taking innovative decisions to gain an edge. 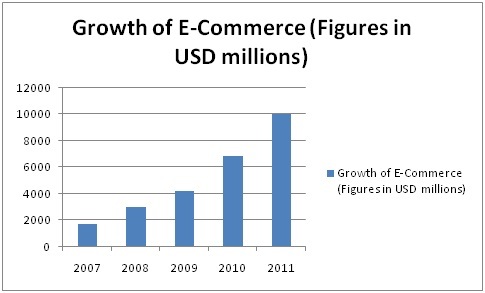 Enterprises have invested a huge deal into e-commerce where things are presented and sold on the internet. The emergence of olx.com, quikr.com etc. has brought out new trends where consumers themselves become the buyer and the seller. This market is expected to grow tremendously in the future (See exhibit below). Consider a user purchasing a book once on Flipkart. The IT system studies this consumer behaviour and next time when the user logs onto Flipkart, he is presented with a set of new recommendation of books. These are the type of BI tools used by retailers to sell their products. Understanding and studying customer buying patterns has become the most important feature today. Customer acquisition and retention based on these studies is possible by leveraging the information crunching with help of IT. According to a Nielson report, Facebook has more than 32 million active users in India alone. 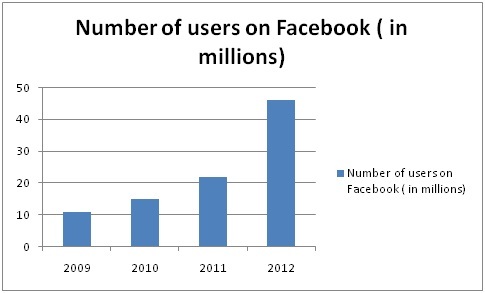 In 2010, India was the fifth largest country for Facebook and in 2012; it has become the second largest (See Exhibit). CSR is the buzz word for organizations today and they are leveraging this reach of Facebook tremendously to promote their CSR activities and their brand. Be it the Mahindra Rise campaign where ideas were asked from consumers via internet or be it Axis bank’s use of social networking sites to reach out to consumers, IT and communications are used extensively. Organizations have realized that to reach out to the massive youth population, social networking sites are the most efficient. Hence you have CSR campaigns launched by firms via Facebook, Twitter etc. Positioning your brand is also of great relevance today and the best way is by making it visible via networking sites. As ICT becomes the major reckoning force for companies, the security features associated moves alongside. One would hence observe security majors such as Symantec, MacAfee gaining prominence in a technological world. As users start adapting more towards internet banking and online means of payment, security concerns become top most priority for the company.There is huge scope here for Indian firms as well to leverage the need for security with changing trends in IT. This will be one of the major challenges and at the same the time is a big opportunity for new firms to enter the IT market to provide security and network packages. ICT has had impact to all facets of the Indian system.Facebook campaigns by political parties have gained lot of prominence recently. The recent India against corruption campaign was a success only because of the use of technology to reach to the masses. One would foresee that in future there might be voting either by use of technology or from personalized gadgets. India needs to be well prepared for it. Right to Education is now a reality in India but education is still limited. This gap can effectively be reduced with the help of technology. Innovative approaches enabled with technology can help penetrate education to every corner possible in the country. Hence with the use of IT, education has moved into the e-learning phase where classes are conducted via streaming and via live conferences. Development of educational content, right from digital books to applications, from animations to video is now a highly competitive market.These are the aspects where companies can gain the first mover advantage in the market. The scope of ICT and its growing presence is unprecedented. It has made us realise that it has the power to cut across sectors and boundaries. Today a camera major like Kodak’s main competition is not another camera major like Nikon, but a mobile phone company like Nokia which provides 41 MP cameras. An airline major like Boeing’s major competition is surprisingly Cisco that enables video conferencing and hence makes travelling redundant. The future today is all “cloudy”. BW estimates the cloud services of Indian market by 2020 to be Rs.90000 crores. Firms have to leverage this to move ahead.Hence now firms have to set foot and battle the cloud wars with their competitors. It has already gained a large foothold in India right across sectors notwithstanding government and education. All India Council for Technical Education which is a part of HRD ministry is one of the biggest cloud deployments facilitated my Microsoft in India. Are the other companies in India ready for the Cloud War? Only time will tell.